Is there ever a right time not to have porridge? My love for porridge began early and probably from the days of those 80’s ads! Who remembers them? “This is the way to glow to school……….central heating for kids!” Children leaving their homes with a glowing orange/red ring around them! Anyone with me?! Well the humble bowl of oats has come a long way since those days and we are definitely pimping up our porridge! Oats contain so many health benefits that it would be silly to ignore. They are incredibly nutritious, a great source of vitamins, fibre and antioxidants and can help improve blood sugar control and lower cholesterol levels. Porridge is very filling too so keeping you fuller for longer. 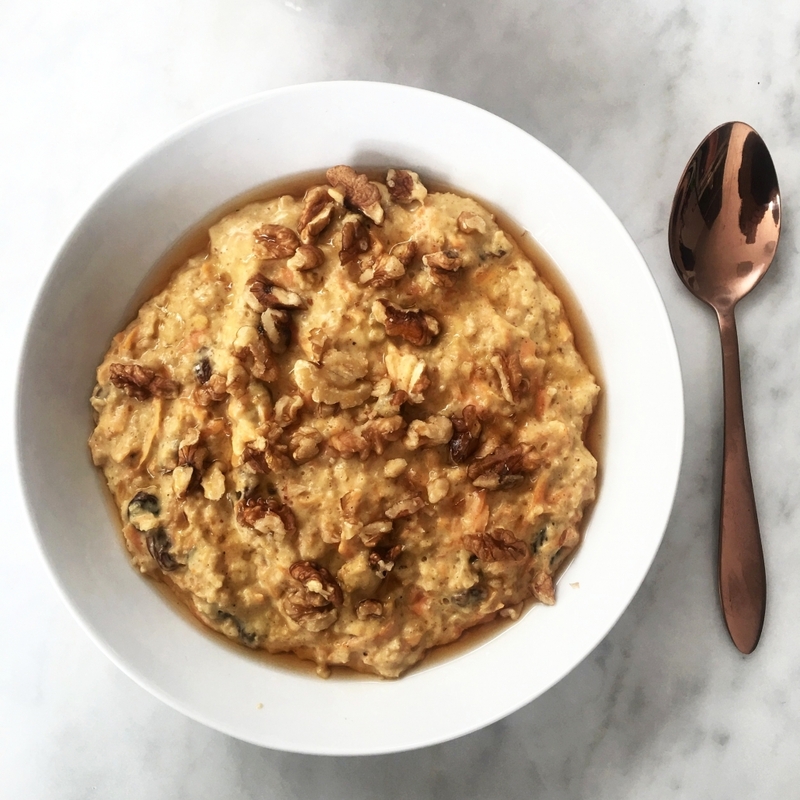 I love experimenting with my porridge and this recipe is my perfect start to a busy day especially as I love carrot cake too. Who said you can’t have your cake and eat it? Place the oats, carrot, sultanas, milk, cinnamon, nutmeg, ginger and maca in a saucepan over a medium heat. Cook until the milk has absorbed into the oats and then add the water. Add your walnuts and maple syrup and serve.